If you’re the King, you really need to live in London. But that comes as a problem if you’re the king of Scotland too. What does a guy do? Commute from London to Edinburgh? in 1603? No: move to London one must, but it is vital to acquire a really good pen. James arranged to rule Scotland by writing to it. This left him free to wrestle with England and foil gunpowder plots. But the consequences of a snail’s pace, or even a letter which did not arrive at all, were dire. Letters must fly from London to Edinburgh with the fleetest of feet. Which is why James invented the Royal Mail. Riders would travel by relay from point to point, passing on royal instructions.Now his written edicts could hurtle up to Edinburgh by royal courier, and the king boasted that he ruled Scotland with his pen. And everyone wanted in. In 1635 the service became available to the public, and a kind of postal service was born. Granted, the Royal Mail became the Parliamentary Postal Service for a decade or so when the Roundheads got hold of the infrastructure, but the second Charles democratised the sending of messages by banishing Cromwell’s dour label and calling the whole business the General Post Office. The London to Edinburgh route was just the first of a filigree network bringing intelligence to the people of England, Scotland and Wales, but it was the spine of the nation and the route has always been beloved. Mounted carriers gave way to horse-drawn carriages in 1784, and in the mid 19th century the mighty train assumed the mantle. The romance of a steam train bringing messages: WH Auden summed it up in his “Night Mail”, the pent-up excitement of the great iron horse hurtling from one end of the country to another, picking up mail as it went. Even the tiniest villages could send their messages using the bag exchange apparatus, a post with a bag which automatically attached to the train as it flew past. In today’s railway carriage the post has been all but superceded by the astonishing electronic communications made possible by modern technology. After our time in Devon a decade ago, Phil travelled up to London to interview for a job and marvelled at the gadgets and laptops, the chimes and trills which filled the carriage of commuters. In the couple of years we had been away from the capital the shape of commuting had changed forever. You could talk to people anywhere in the country from a railway carriage speeding at 100 miles an hour through the English countryside. For centuries, while the night mail carried messages, getting a message off a moving train could be tricky. The thorny problem occasioned a letter to the Times as late as October 18th, 1963. An article the day before had bewailed the problem of sending messages from express trains. How on earth could it be possible? Mr H.C.B Mynors had the answer. “Faced with this same problem on the same line,” he writes to the Times, “I consulted the steward of the dining car. He adds that he tried to press the dining car steward to take a tip; but that but the ingenious gentleman would have none of it. Messaging has changed forever in the blink of an eye and with the speed of communication, our pace of life has increased exponentially. And while I find being away from such communications frustrating, part of me longs for the days when high-speed bag exchanges were the only external communication on a train. Posted in Quirks of HistoryTagged letters to the Times, Royal Mail, steam trains, The Night Mail, trains, WH AudenBookmark the permalink. 😀 Mushy potato. It would explain a lot. I received a letter the other day posted on the 4th which arrived with me, 40 miles up the road, on the 12th. When our first son was born, H sent a telegram to his parents, which they received the same morning!!! I didn’t , Rosemary. I am a technical dullard. I shall e mail those happiness engineers at WordPress and beg them to tell me how to make it bigger. Meanwhile – and I know it’s not ideal – arrow keys scroll up and down so you can check what you put at the beginning…. Wonderful piece of history Kate. I was lucky enough to travel on the Flying Scotsman; on one of the occasions it was bought out of mothballs. It was an amazing journey and I felt as if I was in a different era. I tried to send you US stamp with potato farmers but would not paste. Nuts! May go and google that one, Carl. A masterly piece of lateral thinking. Me too, Kate. Me too. What a wonderful picture. I’ll check out your link, but, not before telling you about a wonderful children’s book that I posted way back when. It is called Mailing May, is based on a true story, and is about May, who wants to visit her grandparents some distance away over the mountain. Times are hard and her parents can’t afford the price of the ticket, BUT, a new regulation has recently passed and, well, the crux of it is that they mail her via the railroad with US postage. What a beautiful idea, Penny – Maddie and Felix would love that idea! (Might put ideas in Felix’s head….) Must look it up. If expecting a message, please keep a sharp eye out and stand well back from the train to avoid injury! Another take on trains and potatoes (as with so many of your blog posts, it segues beyond the original tale): http://brevia.com/General/Lessons.htm Hope you’re having a great day! Yes: health and safety was less of an issue in the 60s, Karen! Loved the story. What a beautiful message to get from the story. I shall remember that all week. Especially when they are texting people sitting across the table from them!!! 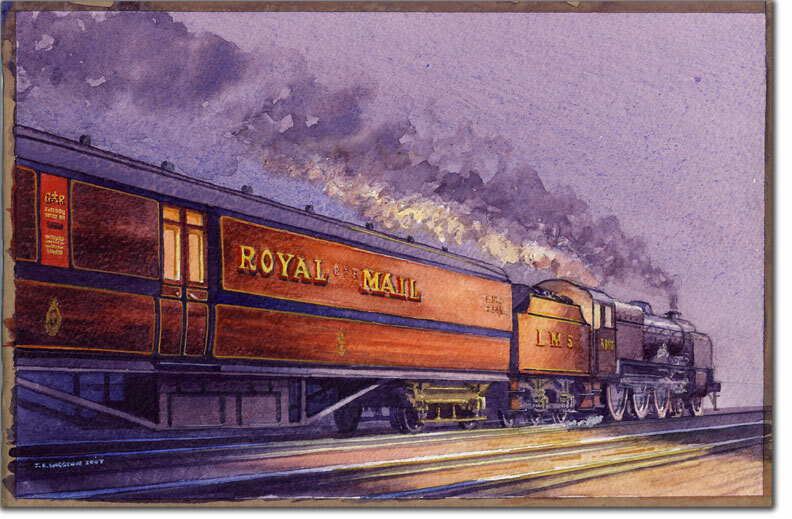 Talking of mail trains reminds me of my dad. He was born in 1885 in Missouri USA. I learned after his death in 1968 that he had worked in the mail car of a train going from the middle of the US to California. He eventually quit because his feet hurt too much from standing sorting mail all the time. I wish I had known at a time when I could have asked him questions. Wonder if he unhooked any bags from where the train caught them? Can’t quite see him hurling a potato. What a fabulous discovery to make about your Dad, Joyce. That route must have been a little piece of history at that time…in my research I came across hook-mail bags on the networks in the US : certainly at railway post offices…http://en.wikipedia.org/wiki/Railway_post_office. Thanks for coming along to read today, and taking the trouble to comment! I am ever so grateful to James! I had to post a wedding gift from Edinburgh to London due to the terrible delays at terminal 5! Quite. You think it might catch on? I love it Martin! Mind you, the impression of pace belies the time it takes for my letters to get from one place to another. Maybe they just have very long tea breaks. Wonderful tale of missives and men . . . with the occasional spud tossed in for good measure. Lovely idea for a dinner party though, eh? Pass messages in the potatoes or use them to make the place settings? There’s all sorts of fun buried in this post Kate. Oooh, a potato messaging dinner party. I LOVE that idea, Tammy…. I agree. I have been sending mail to someone lately and have received great compliments for it. In a digital world, something solid holds more value…At least in the way of a letter. Not just fast food – but fast food with a message? ! You are a chip off the old block Kate. Dear Kate, the web of railway–which you called “the spine”–reminded me of your post yesterday on spiders and their webs. And now we have the world wide web. Tracks within tracks. Peace.